STAY AT HOME MOM: Hair Flairs - Pro Hair Tinsel Review & Giveaway - ENDED! 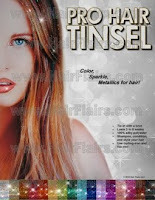 Hair Flairs - Pro Hair Tinsel Review & Giveaway - ENDED! 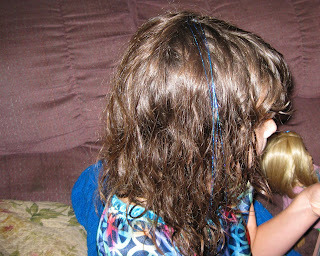 I recently received two packages of Hair Flairs Pro Tinsel to review and offer in a giveaway. The timing of me reviewing this product actually couldn't be better. Literally the day I was approved to be sent some Hair Flairs, my daughter asked me if next time she goes to the hairdresser, could she get a strip of her hair dyed. I guess a friend of hers had a purple strip in her hair for months. I am not passing judgement on what others let their kids do, but I'm sorry I am not letting my 10 year old daughter get purple dye in her hair. So I figured the Hair Flairs could make her happy for the time being. When the products came, my daughter wasn't home from school yet, so my husband decided to test them out on me. Let's just say he never got them in my hair. I was tired on Friday, and actually went away this weekend so I decided not to even tell my daughter that they came until Sunday night. I watched the Hair Flairs YouTube video to hopefully have better luck then my husband had. I think I got them in somewhat correctly in my daughter's hair. I put two blue ones on one side, and two gold on other. Win it: One lucky reader will win one package of 100 strands of the color of their choice. Mandatory Entry: You Must Do This First- OR all Other Entries Will be DELETED! Please visit Hair Flairs Pro Tinsel and tell me what color you like. 1. Tell me who will use the Hair Flair if you win. RULES: Giveaway is open to US and Canada! Giveaway ends September 28, 2010 11:59 PM EST. Winner will be chosen via Random.org. Must have valid email in blog profile or leave email in comments otherwise you will be disqualified. Winner will have 72 hrs. to confirm by email, If no confirmation in that time frame a new winner will be chosen. I like the Sparkle Champagne. I'd give these to my (teen) granddaughter who has dark reddish-brown hair. I follow your blog publicly on Goggle Friend Connect. How fun is this? I'd love the diva purple. Thanks for the great giveaway! I'd let my nieces use these...they're all about the hair streaks right now! Hi, I like the Sparkle Light Ocean Blue. If I win, my daughter will use these. I follow your blog on Goggle Friend Connect (publicly). I "Like" STAY AT HOME MOM on Facebook (FB name: Maddie Brubaker). I follow STAY AT Home Mom on Networked Blogs. I entered the Flexi 8 giveaway. My daughter would love the Sparkle Diva Purple for her birthday!!! Liked STAY AT HOME MOM on facebook!!! If I win this my 9 year old daughter will use them. These are so cool! My favorite color is the Sparkling Deep Dark Red, but my girls like the Sparkling Rainbow! I would use these myself, as well as on my two daughters (ages 7 and 9)! I love the Sparkle Candy Apple Red. I would use these Hair Flairs, but I can't wait until my 13mo daughter has enough hair to share them with me! I'd love diva purple. Hard to choose, though! I will be the one to use it, esp. for art openings and concerts! I LOVE the Diva Purple. I have red hair, so I think the shamrock green would look pretty cool. My friend and I would use it for Halloween or maybe for a night out! I think the Sparkle Kaleidoscope (Rainbow) would be stunning in my daughters hair! I like the Sparkle Shamrock Green. I like the sparkle gold! I love Sparkle Kaleidoscope (rainbow). So cute! If I win they would be for my daughter. I like Sparkle Kaleidoscope (Rainbow). Sparkle Diva Purple is my favorite! I like Sparkle Disco Ball Silver. Although, if i won then I'd like to let my teen daughter pick the color since she would be the one wearing them. I'm sure she'd love love it! I would love to use it for me! I like the Sparkle Diva Purple. my mother and i would use them for our football parties on sundays! I will so totally be the one to use them! I am the only one with hair longer than an inch in this house full of boys! Sparkle Deep Dark Red is cool. If I won I would use it. I like the Sparkle Light Ocean Blue. I am trying to win these for my daughters.